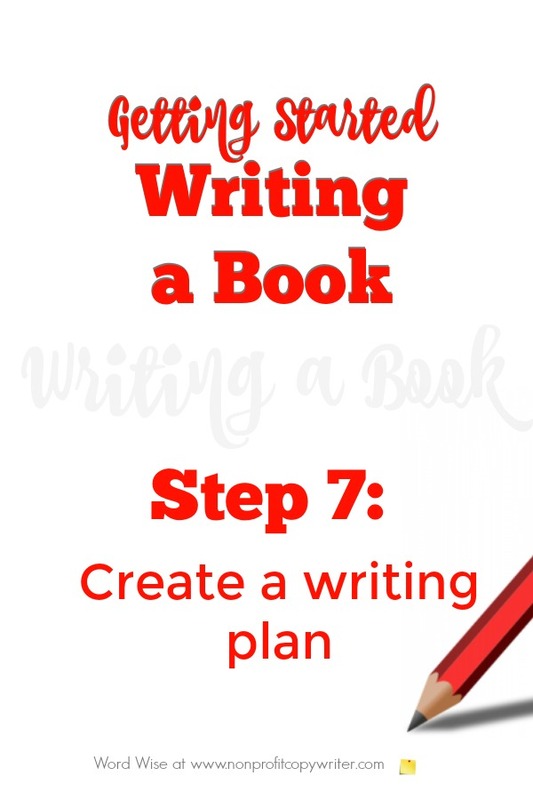 In this book writing help step 7, you’ll create a writing plan to get your book onto paper. As you may know by now, a book is just a series of small bits of writing, strung together. To write a book, you simply break down the whole into smaller parts. Then you work to complete each small part, one at a time. Now that you know what your book will be about, how you will publish it, and how you will structure it, all you need to do is write it. You need a writing plan. This step guides you through that process. A plan is simply a series of steps.Your writing plan can be as simple or as detailed as you like. It’s up to you to decide … but decide you must. When you put together a list of small, measurable tasks to accomplish one by one, you have a writing plan. Work your plan and soon you’ll have a book manuscript. You can create a writing plan for a full chapter and then write the chapter … for several chapters, as in section of the book, and write the section … or you can create a plan for the entire book project and then write the book. By creating a writing plan, you give yourself a series of writing assignments. Completing one step of the plan becomes akin to writing a blog post or an article or a page of web copy. It’s a short, manageable chunk. This makes the project manageable and gives you the feeling of forward motion. By writing down steps – a series of “writing assignments” – you stay focused. The step-by-step approach is particularly helpful when you have only a short amount of time to write each day, such as 30 minutes. Your writing plan gives you the day’s assignment. You can spend your writing time working to complete the assignment rather than spending 30 minutes deciding what to write. Create a writing plan for the first chapter of your book.